Player 1 starts in a stride stop left foot forward for a right hand shooter (opposite for a left hand shooter). 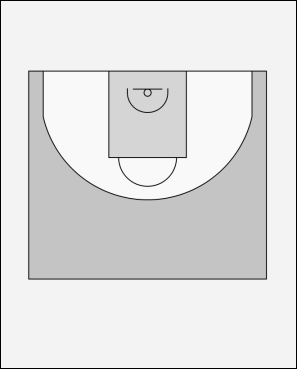 A pass is made and player 1 pounds the ball with two hands as they step forward to shoot. Play the game LOW to HIGH. Similar to the two hand pound drill, except the player now places their non shooting hand behind their back. A pass is made and player 1 catches the ball one hand, pounds the ball with that hand (the other hand comes around quicker) and shoots.